It's bad enough that some people will go to any lengths to "beautify" themselves but camels? Lol what a wonderful world! Lol! My appointment is on Monday! Really, not kidding! Amazing but true, Australia is the best source of camels, courtesy of Afghan cameleers who brought them to Australia and provided inland near desert areas with goods transport, also operating as traders, operating what were called camel trains. We've all heard the joke about the new recruit who got stationed in a remote desert outpost and after a few weeks asked one of the other guys what the men usually do when they're getting a bit horny. The guy replied "Well, they use the camels." When he was caught being romantically involved with a camel and taken to the Commanding Officer, the CO asked him what he was doing and the new recruit replied "Well, I asked the Sgt. what the guys did when they wanted some female companionship and he told me the guys used the camels." The CO laughed and said "Yeah, that's true, but they ride them into town." "of course if you fancy a camel, you`ll want a good looking one"
"they never met a yewe that wouldn't do! Ah, the ram`s lament, a popular song: "I`ll never find another you"
Thread reminds me of a lawyer I knew who looked in on a case in another Court where a man was charged with an act of "familiarity" with a pony. Returning, he commented "I saw the pictures, it`s not even a good looking horse". That the Kiwis have found two more uses for sheep. Now, RT, you wouldn't eat a camel that had not been properly "dressed"; or would you? Mr. Moon. Given that my OP very quickly sank to levels of innuendo I had not intended I'm hesitant to attempt to understand exactly what the tone of your question is. I will take it at face value and say that I have not as yet eaten camel but given the opportunity I probably would try it. There ARE a few things I would probably NOT try: Dog, cat; live octopus or Fugu (served in Japan), most of the organ meats (offal with the exception of heart or liver), haggis...UGH!, but camel? Sure, why not? Some enterprising rural folk here are now farming camels to produce milk. Other dairy products too, and of course meat. Early days yet, but promising, and there is no discrimination on beauty grounds. We`ve been producing from goats for some time, often by capturing the feral ones, so no reason it won`t succeed. Did anyone know a treatment similar to Botox has been used to treat reflex sympathetic dystrophy by infusion treatment in hospital. The condition is essentially an abnormal nerve response in a limb to minor injury, such as a simple cut. The limb turns blue, undergoes temperature changes, changes of sensation, etc. Sometimes it works, sometimes not, and the condition can just suddenly resolve. Seems camel milk is in the same range as cow's milk but alas, thus far, I am unsuccessful in finding ANY reference to BF content of the platypus...Any idea? RTF, the "Landline" TV program dealing with matters rural which I saw on ABC TV(the[very anti] Govt channel) did say camel milk was high in fat and analyzed as close to human milk. As to platypus milk.....no "Landline" mention at all, very disappointing. Camels look somewhat surprised being hooked up to dairy milking machines, the thought of a platypus playing along....well...first find your platypus. Devilishly hard to spot,I have tried,but have only ever seen one in a special display tank in a zoo. Males have a venom spur on a rear leg, think about milking one of those too. I was the Guest at a dinner party in the Sudan years ago I had to try the Raw Camel Liver "appetizer" offered to me by the host. Chunks of raw camel liver in a bowl of blood. Fortunately there was so much "Chatta" the local fiery pepper, kind of like a Habanero in it that I didn't wind up tasting anything at all. The next "Appetizer" was raw chunks of goat tripe, also with plenty of Chatta, same result. The rest of the meal was quite good, grilled sheep, rice, and pita like bread. Mr. BK. While there is some evidence that male platypodes do lactate, there is none suggesting they take any role in nursing. Perhaps your gender role confusion is an extension of species role confusion alluded to in post #'s 5 thru 9. 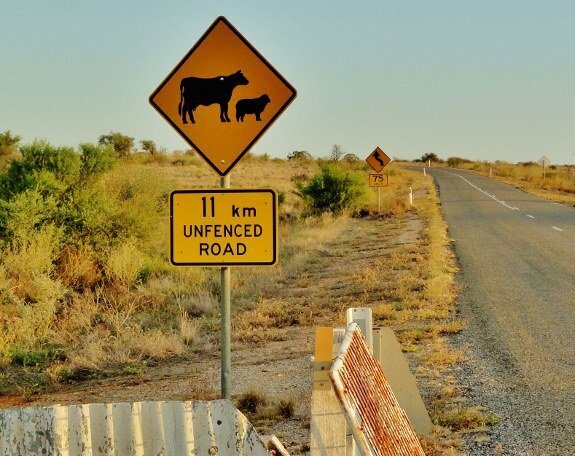 Fairly sure you are right.The road sign,seemingly located at a cattle grid, is an oft seen warning, rather than invitation,to motorists. I don`t think I`m that confused.Not about that anyway. It never entered (what passes for) my mind that male platypuses might lactate. Most impressive you discovered the Greek plural for platypus, not in common(or indeed any) use here. Botox for camels certainly is weird, but so is dying your poodle or docking your Rottweiler. Btw- camel is quite nice to eat. It is very lean and a bit stringy but nice flavour. I often bought minced camel at the market in Tripoli for my spaghetti bolognese. I had a mate who was a guest at a dinner in Borneo years ago..........apparently he was quite delicious.